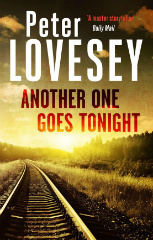 Another One Goes Tonight was published in July 2016 by Sphere in the UK and Soho Crime in the USA. Peter Diamond, the Bath detective brilliant at rooting out murder, is peeved at being diverted to Professional Standards to enquire into a police car accident. Arriving late at the scene, he discovers an extra victim thrown onto an embankment – unconscious and unnoticed. Diamond administers CPR, but no one can say whether the elderly tricyclist will pull through. But why had the man been out in the middle of the night with an urn containing human ashes? Diamond’s suspicions grow after he identifies the accident victim as Ivor Pellegrini, a well-known local eccentric and railway enthusiast. A search of Pellegrini’s workshop proves beyond question that he is involved in a series of uninvestigated deaths. While Pellegrini lingers on life support, Diamond wrestles with the appalling possibility that he has saved the life of a serial killer. Only a full-on murder investigation will uncover the truth. 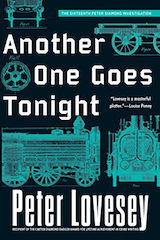 Peter Lovesey sprang to success when his first book won a crime fiction competition. Since then he has collected almost every prize there is, at home and internationally . . . A series of surprises leads up to a skilful and unexpected solution. Another triumph for the old master.